Recycled baled card and paper awaits its re-use. UK Government Department Defra has released figures which show that for the year to the end of June 2010, the English local authorities achieved their 40% recycling target. What is more, is that more recycling is being achieved month on month. Back in 2007, the country recycling average was little more than 15% when the government set out their Waste Strategy 2007 to reach this by 2011, and it sounded like an almost unachievable increase. 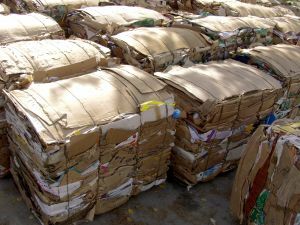 What is also quite surprising when other nations, such as the US, are still experience rising waste generation rates is that a further fall has taken place in England’s average waste tonnage per person, bringing it down to 456kg. Whether this is likely to be sustained once the economy improves is not something that Defra has commented upon. The Chief Executive of the CIWM, speaking for England’s waste management professionals, said that not only must the nation continue to do better than this, it must comply with EU requirements to provide a national waste prevention plan. This would be essential if when the economy improves the waste quantity per head of population starts to rise again, as he suspects it will. Many people would like the government to go much further, and indeed announcements were made around the time that the coalition government came into power last May that England would follow in the steps of Scotland, and go for zero-waste to landfill. Meanwhile, there are many integrated waste management contracts underway from initiatives made by the previous labour Government now awarded with construction underway on them. These amount to, of the order of thirty, major waste construction contracts under Private/Public funding arrangements, which as they are brought on-stream will continue to raise recycling rates still further. With some inner city boroughs doing much less recycling than the suburban and rural, populations, there will now be popular pressure on those less recycling boroughs to take action to make the simplest wins, which can be achieved now. That is, by finding ways to lift their performance to equal the better performing Councils.